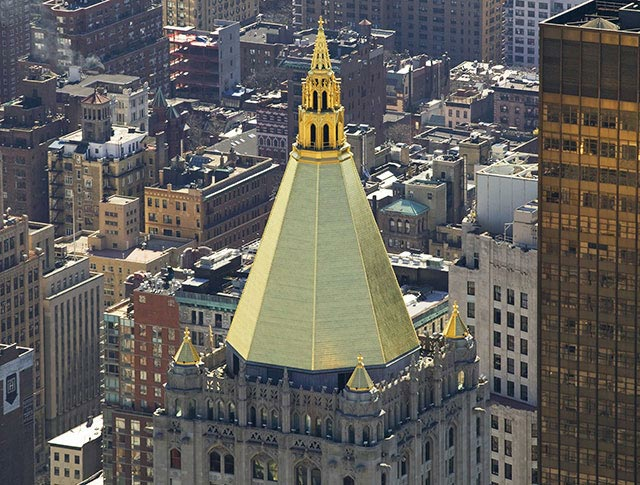 The lantern-topped roof of the New York Life Insurance Company, in Manhattan, stands at 30,000 square feet and is composed of 25,000 gilded tiles. An increase in the preference for preservation over gut-job renovation has paid off for those in the industry who are qualified in gilding. But in addition to the rewarding work, Gilders’ Studio President Michael Kramer notes that there are many challenges, from surface preparation to educating other industry professionals about what exactly a gilder does..
“There was a resurgence of historical restoration, especially in D.C. in the late ’70s [and] early ’80s,” Kramer said, and that’s what prompted the inception of the studio in 1985. Since then, it’s been a steady increase, especially in the past 15 years, according to Kramer. Before the surface prep, though, there’s investigation and testing of the site—a process that doesn’t typically come cheap. “But it’s a lot cheaper than having the job fail,” Kramer adds. Those investigations can uncover some unpleasant surprises. Kramer recalled an early 2000s job on the top of the New York Life Insurance Company, in Manhattan, which Kramer referred to as the largest exterior gilded structure in North America. New York Life Insurance Company, in Manhattan, stands at 30,000 square feet and is composed of 25,000 gilded tiles. The lantern-topped roof stands at 30,000 square feet and is composed of 25,000 gilded tiles. Kramer said that as far as technical difficulties go, this project tops the list, partially because they had limited access to the site (about 40 floors and 600 feet in the air). Kramer said that as far as technical difficulties go, this project tops the list, partially because they had limited access to the site (about 40 floors and 600 feet in the air). The issues didn’t stop there. In the amount of time in between when the investigation, testing and subsequent specifications are written for a project, and when the work is actually slated to begin (In the case of the NY Insurance Company building, it was years), the materials specified could no longer be available because of the huge impact changing regulations have on this segment of the industry. 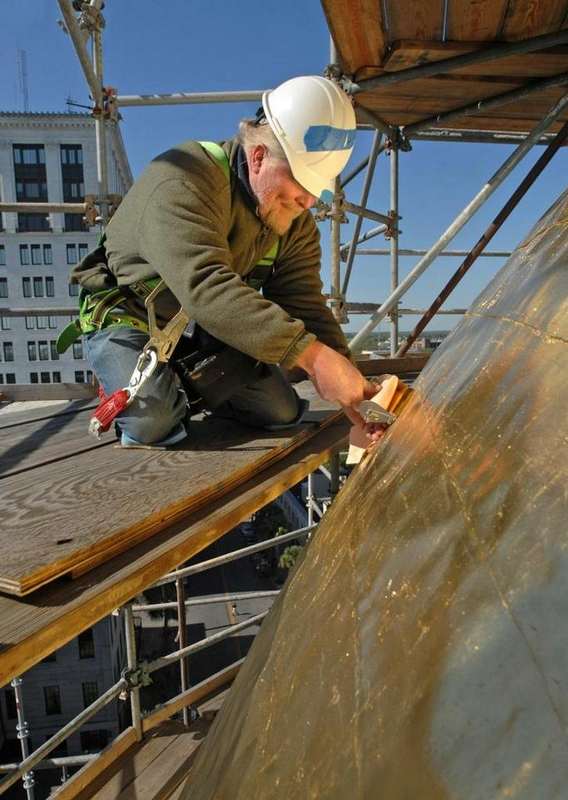 That was an issue with the New York job, both the size (the adhesive used with the gold leaf) and the primer system originally specified (in 2003) could no longer be used by the time the project was supposed to start (in 2007). Kramer said that the specification gap isn’t just job-specific. But industry-wide specifications aren’t the only problem. Industry-wide education also needs some work, Kramer says, noting that many industry professionals not versed in gilding—even some designers—don’t know how much goes into the process or how delicate it is. 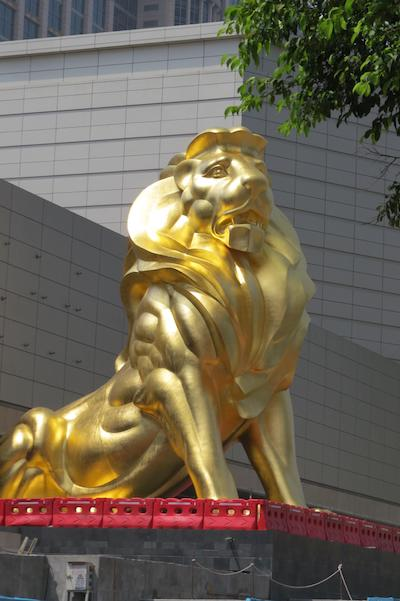 The more education, the less time will be spent retouching work that was ruined by the hands of other workers, as was the case earlier this year, when the Studio completed a 40-foot tall lion statue in collaboration with ThemeWorks at the MGM Cotai Hotel and Casino in Macau, China. The 38-ton lion likeness was constructed out of glassfibre-reinforced concrete and clad entirely in 23.75-karat gold leaf. After the statue was done, but before it was put into place (well above where people can get to), workers on the site got a little too close. “They were standing on top of the paws and ruining it. Taking selfies. Workers! I don’t blame them on one hand, they don’t know,” Kramer said. He said he’s found that no one wants to take an actual class. Kramer, who had taught gilding for a number of years said his firm does trade shows and demonstrations, but beyond that, he’s at a loss for how to fix this particular challenge.